Hooray for Friday, the best day of the week, and I’m looking forward to this one even more than usual. When I was planning my schedule for this week, I set aside a few hours for shopping today. I’m heading to two of my favorite stores, Trader Joe’s and Anthropologie, and though I’m sure my bank account won’t be a fan of either stop, I can’t wait. I hear rumors that Trader Joe’s has some of their Christmas products out – you know what that means, right? Time to stock up on Candy Cane Joe-Joe’s! We’ve been talking Thanksgiving all week, and I’ve shared quite a few ideas for your menu: two side dishes, rolls, and a dessert option. We haven’t hit on all the major categories though. We’ve yet to talk pies, which are pretty much synonymous with Thanksgiving. You just can’t have Thanksgiving without them. No worries – next week I have two great recipes for you and there may be a few awesome giveaways too so you’ll definitely want to check back! The other big category we haven’t touched on yet? Appetizers. I really like having a few finger foods to snack on while the meal is being pulled together. 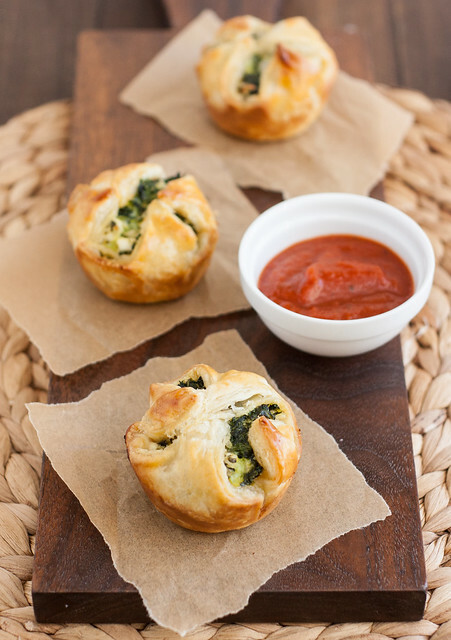 If you feel the same way, you need these Spinach and Feta Puff Pastry Bites – they are the perfect finger food! 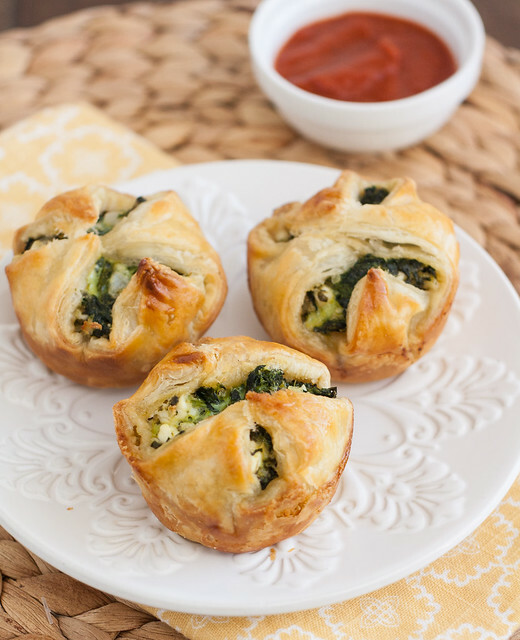 Buttery, flaky puff pastry stuffed with a creamy spinach and feta mixture, it’s hard to go wrong with that combination. Spanakopita fan? I think these are even better because puff pastry is about 100x easier to work with than filo. This recipe originally called for baking the puffs in a standard muffin tin, so I made a few that size, but also baked several in a mini muffin pan instead. 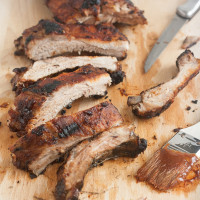 The minis are a great two-bite appetizer, while the larger ones could definitely be served as a side dish or even vegetarian main course. (Size difference indicated in the photo below.) 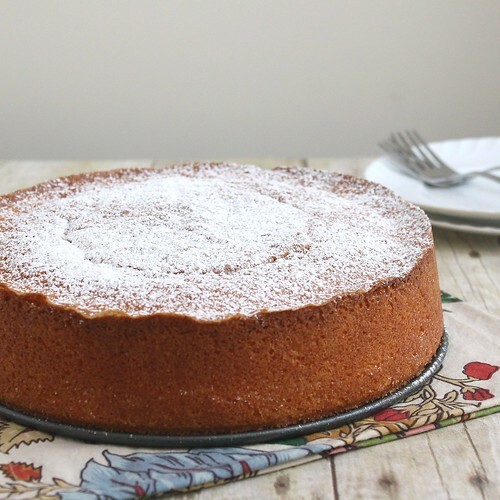 Added bonus – either size can be prepped several hours ahead of time and baked off when your guests arrive. These puffs are one of my favorite appetizers I’ve made in a while; you won’t regret it if you find room for them on your menu! Preheat oven to 400 F. Spray your muffin tin with nonstick cooking spray. Wrap the spinach in a clean kitchen towel and squeeze out as much water as possible. Transfer the spinach to a medium bowl. Add the feta, onion, olive oil, nutmeg, and garlic and stir to combine. Season the mixture to taste with salt and pepper (and additional nutmeg if desired). 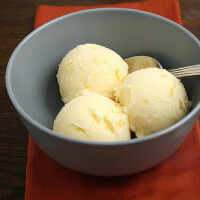 Crack one of the eggs into a small bowl and lightly beat it with a fork. Add the egg to the spinach filling and stir until evenly distributed. Set the filling aside. On a lightly floured surface, roll the puff pastry out into a 12-inch square. Cut the pastry into 3 equal strips – you only need 2 of them for this recipe so save the third for another use. You have two options at this point: To make the larger puffs, cut each of the remaining strips into three squares (for a total of 6 squares). 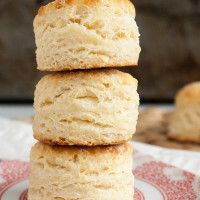 For the bite-size puffs, cut each of the remaining strips into eight equal pieces (for a total of 16 rectangular pieces). Crack the remaining egg into a small bowl and lightly beat it with a fork. Brush the egg wash over the exposed surface of the puff pastry. 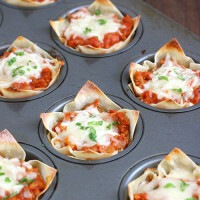 Bake – the bite-size puffs need about 20 minutes, while the larger puffs need about 23-25 minutes. When the pastry is puffed and golden brown, remove the muffin pan(s) from the oven and transfer to wire racks. Allow the pastry to cool for a few minutes, then remove to the rack (if the puffs are sticking to the pan, run a small paring knife around the edges to loosen). 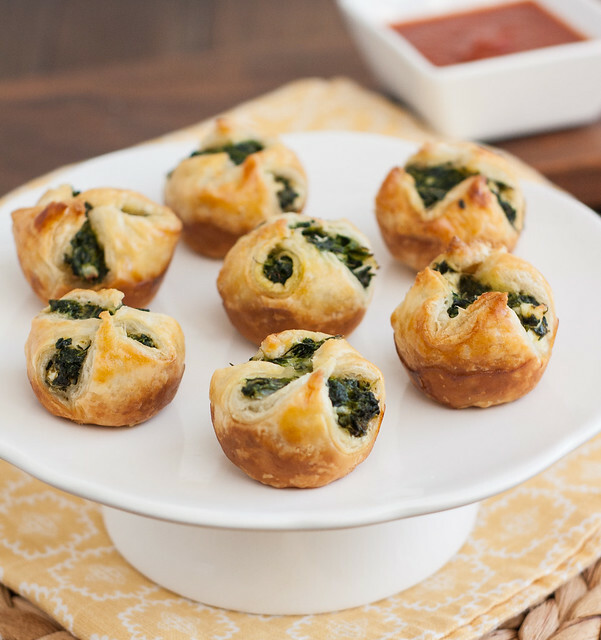 18 Responses to "Spinach and Feta Puff Pastry Bites"
I’ve recently tried some store-bought spinach and caprino puff pastry bites and loved them but I’m sure the home-made version would be even more delicious! Since I’m not a huge fun of feta I think I’ll substitute it with other cheese but I’m sure the final result would still be amazing! Spinach and feta is my favorite combo! I love these little bites… thanks for sharing. 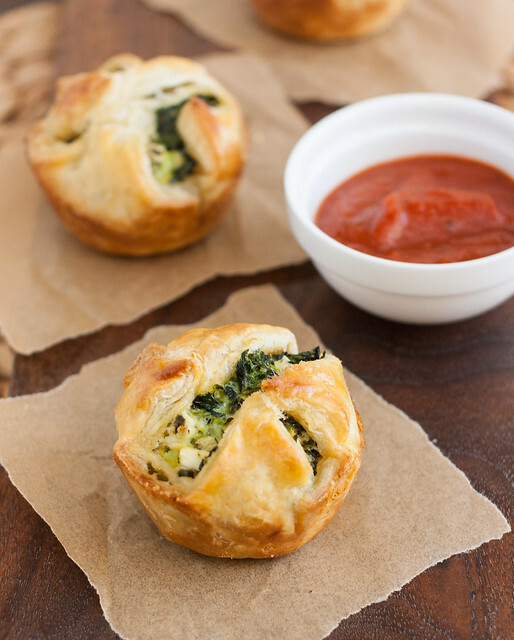 I love the idea of this as an appetizer… or maybe a quick after-school snack. 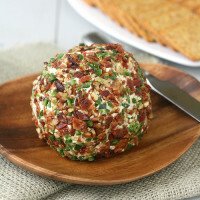 My family is not crazy about feta, although I love it so I will have to try it with a different cheese. Now I’m off to the grocery store to see if I can find puff pastry. 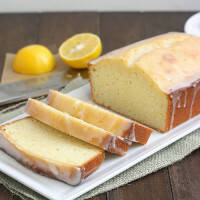 Thanks for all your great recipes. Yes, yay for Friday! 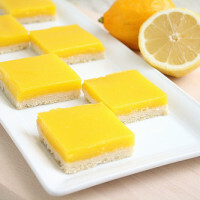 I love these bites, Tracey. Awesome flavor combo!! So jealous! We don’t have Trader Joes, so I always go crazy in there when I’m in the States. 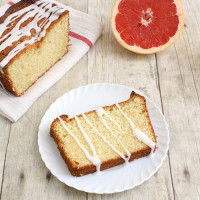 Also, this pastry bite looks awesome!! These were delicious Tracey! Thanks for sharing! These were incredibly tasty! We had them as appetizers last night and I had one for breakfast this morning. Regarding the re-heating, we placed a few on a pizza stone in the oven last night and they came out perfect! The one I re-heated in the microwave at work this morning was still good, but didn’t retain the lightness and crisp character of the original. The flavor was still awesome tho, thanks for sharing! Oh wow the perfect appetizer!! I love anything with feta in it 😉 can’t wait to chow down on these! I am definitely crazy excited about these as appetizers (and SUPER excited to see what pies you are making next week!). Also – if you stop at Trader Joe’s I SO need you to report back on the chocolate swirl cookie butter. STAT. I love this combo!! Perfect holiday food if you ask me! Love the mini ones! I’m obsessed with anything puff pastry now, so I can’t wait to try these! 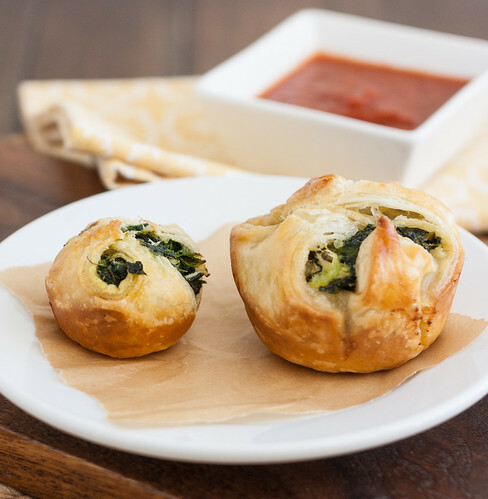 I love that you could fill these with a ton of different things and have a great little spread of appetizers…although I’m digging the spinach and feta combo! They look delicious. Will try tomorrow. 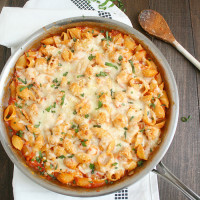 What’s the red sauce in the picture? Is it to accompany the appetizer? These are perfect for holiday appetizers. Love that you can do them ahead and they are ready to go. And I’m with you– Trader Joe’s and Anthropologie are the perfect way to celebrate Friday!